Beyond brightness: Learn the professional techniques you need to know to create dynamic LED In Ground pool lighting. The popularity of LED pool lighting has increased dramatically. Customers want excitement in their pools and LEDs are a perfect way to get it. Longer life cycle and low wattage usage of LEDs also gives pool owners a cost effective option. But not everyone knows how to get the most out of LED pool lighting. This guide helps you create dynamic lighting your customers want in their backyard pool. Lighting in water is very different from lighting in other environments. The “brightness” of the light is not the only thing to consider when designing underwater lighting. The interior color and texture of a pool has a strong effect on the quality of light in the pool. Darker pool surfaces will absorb more light. Lighter surfaces will reflect it. As a rule of thumb in darker pools, expect to use 1.5 lights for every 1 light used in a lighter pool. Surprisingly, even when it seems perfectly clear the water itself can absorb light. The rate of absorption varies from color to color. 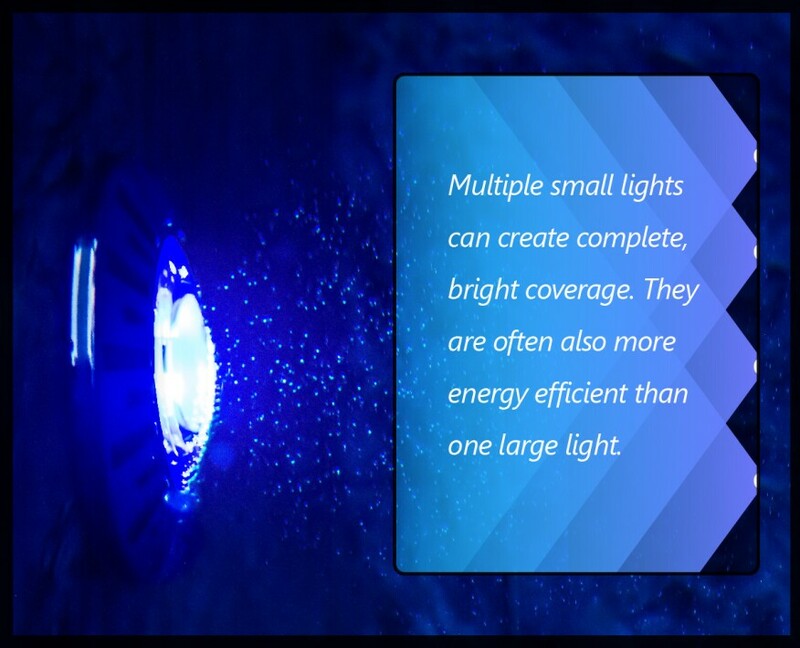 For example, blue lights may appear 5x brighter than red lights even with identical output. The “brightness” will change dramatically between different colors and programmed light shows. Single Lights. 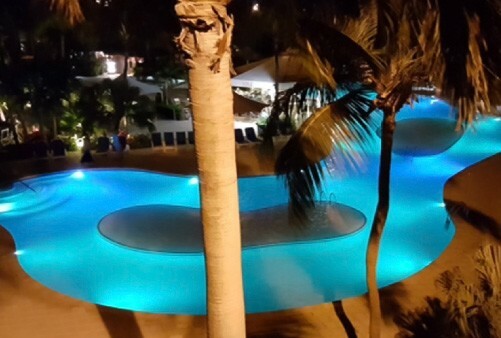 For small pools with no obstructions, it’s possible to use a single light placed so that it lights the length of the pool for even illumination. Opposing Lights. For longer pools, multiple lights can be used on opposing ends of the pool. This provides even illumination and prevents shadows created by obstructions in the pool. Width Illumination. Some pools are longer than the maximum distance a light can travel. In this case, lights should be evenly spaced along a wall facing away from the house. A good rule of thumb is to place lights one every 8ft, and 4ft from the end of the pool. Ledges & Swim-Outs. Swim-outs or ledges can make opposing lights impractical. Place lights opposite the ledge area for safe illumination. With compact size lights, it’s possible to place a light over the ledge or steps creating additional safety and even illumination. Pool Entry Steps. Larger pools have steps on the narrow edge of the pool making it impossible to place opposing lights at each end. In this case lights should be installed on the length of the pool closest to the house. This provides appropriate illumination for the pool and steps with minimal shadows. Irregular & L-Shape Pools. For unusual pool shapes, each section should be treated as a separate pool with its own lighting requirements. Small Freeform Pools. Use the same principles as other pools for smaller freeform pools. The best option for even illumination is lighting from opposing ends of the pool. Large Freeform Pools. As with larger more traditional pools, lighting from opposing ends may not be possible. When placing lights along the length of a curved pool, the shape of the wall should be considered. Inward (concave) curves focus the light towards the center of the pool, so lights on these walls can be placed further apart than normal. The more pronounced the radius, the further apart the lights can be. Compact lights can easily be placed on a curve. With larger lights take care to ensure the curve of the wall doesn’t cause excessive stress on the installed light. Successful pool lighting design includes good composition, safety, and energy efficiency. A play of light and shadow creates an emotional experience for the homeowner. With endless options on the market today, it’s easy to get lost in the sea of LEDs. Installing versatile compact LED lights with small energy footprints is a great way to achieve brilliant design.